I have lately observed the increase in demand for gluten-free recipes. Gluten is the protein found in wheat, barley and rye. More and more people are being diagnosed with gluten sensitivity, but want to be able to eat some of the recipes they love. I adapted this muffin recipe from one I found on bigeatstinykitchen.com. It uses almond flour instead of wheat flour. Almond flour is pretty pricey, but can be made using blanched almonds and a food processor for a bit less money. I made a few modifications to this recipe, the main one being the addition of flaxmeal, which is high in omega 3 fatty acids, (good for brain functioning and development in kids). I buy golden flax seeds in bulk, grind them in my Blendtec blender until they resemble a fine meal, and then store them in the refrigerator. The golden flax seeds have a light color so I can sprinkle it easily into soups, breads, smoothies, cookies, etc. without changing the look of my recipe. Don’t be afraid to keep baking these until they are really done in the center. It can be a bit mushy inside if you don’t. Some people liked the mushy undercooked consistency, but if you don’t then keep baking them. Take one out of the pan and cut into it if you are not sure. Preheat oven to 350 degrees. Use 1 tablespoon of coconut oil to grease a 12 cup muffin tin. 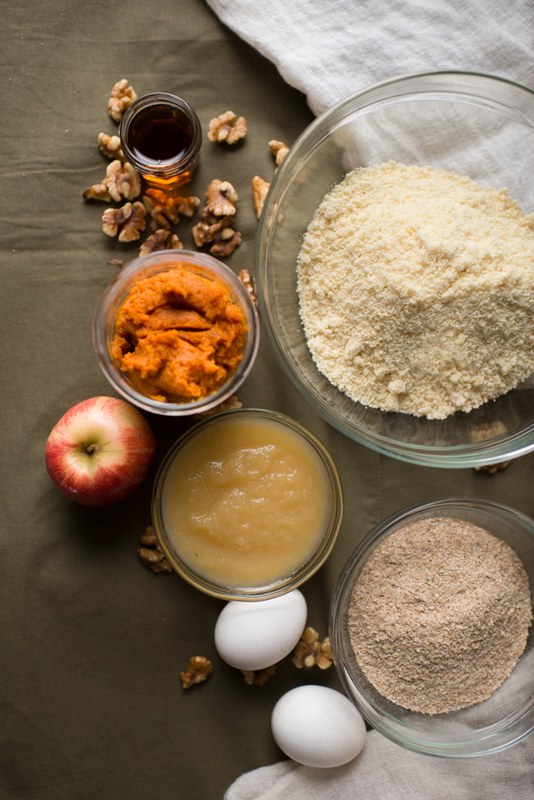 In a large mixing bowl, combine eggs, pumpkin, maple syrup, 2 tablespoons of coconut oil, and applesauce. Add diced apple. In a separate bowl, combine almond flour, flaxmeal, baking soda, salt, and spices. Add the dry ingredients to the wet ingredients. Mix until combined and there are no obvious lumps. Add nuts. Spoon the batter into the muffin tin (it will be thick). Distribute until all 12 tins are equally full (about 2/3-3/4 of the tin will be full). Smooth down the tops. Bake for 30-36 or until golden brown and cooked through. The toothpick trick does not work so well, so check doneness by removing one and cutting in half. CooL on a rack . Freeze leftovers if you have any! Bite-sized pieces of muffins can be a great finger food for babies. 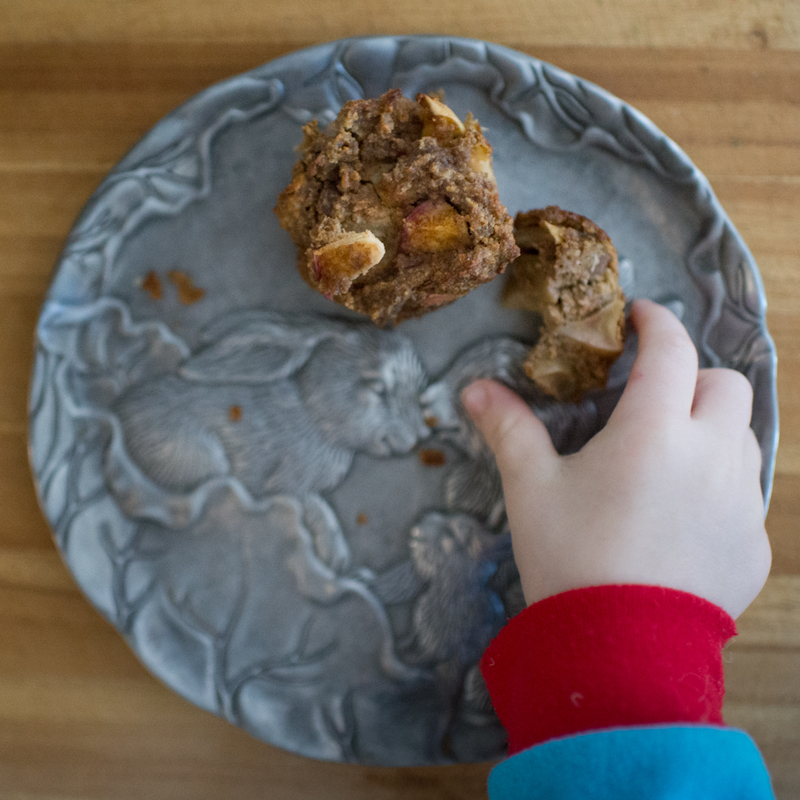 Consider omiting the walnuts for babies muffins to avoid the possibility of a larger nut presenting a choking hazard. The other ingredients when baked should be soft and easy to swallow.